Spray the Salt Eliminator, let it soak a few seconds, then rinse with clean water. According to the City of Toronto website, 200 salt trucks roam the streets during winter, spraying 130,000 to 150,000 tonnes of rock salt to make your drive a little safer. Rock salt is the same molecule as your table salt (sodium chloride) but is a larger grain and may contain other ingredients to enhance ability to melt the ice. 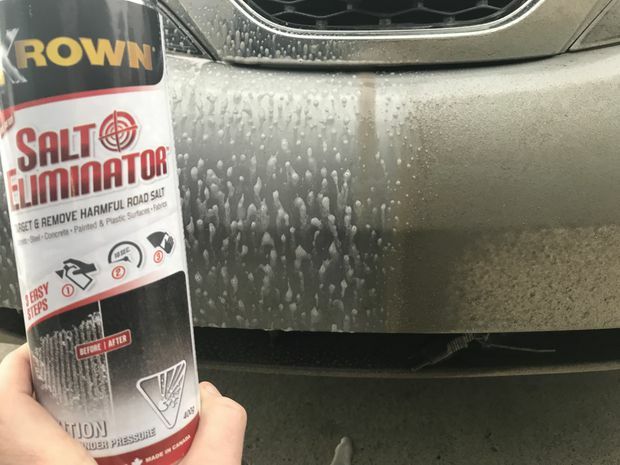 When sprayed, it is going to stick to your vehicle and accelerate the rate of body corrosion. It’s also going to wreck the floor mats and carpets. Krown has created an aerosol to help you remove that grit from any carpet, steel and painted or plastic surfaces. The pleasant-smelling, non-toxic foam spray dissolves the bond between the salt and almost any surface. Spray the Salt Eliminator, let it soak a few seconds, then rinse with clean water. The grime instantly drips off the car when the spray hits. Testing it on the floor mats took two treatments, but they came out pretty clean. That salt line that is usually left when just using a water spray was eliminated, too. Are remote car starters worth the price? Are these as-seen-on-TV sunglasses effective for driving?